The Society shares Noank history through its book publications, by local authors, which has stimulated interest in the community and the Museum. The Museum's archives are a source of material for published works. The Society has provided a supportive, information rich venue for those who have written and published thus far. An ongoing objective of the Society's efforts is to continue promoting research and publications. Celebrating the EMMA C. BERRY: The history and adventures of the last Noank, CT fishing sloop and the people who helped her reach her 150th birthday, by Larry Jacobsen, edited by Penny Newbury. The Emma C. Berry, built in Noank, Connecticut in 1866, is the last known fishing smack and a National Historic Landmark. This overview, with photos and illustrations, follows the Emma C. Berry and her owners, crew, and admirers, as she underwent changes in rig design from sloop to schooner, and changes in service from fishing boat to lobster transport to coasting schooner to cargo carrier, finally being donated to Connecticut's Mystic Seaport in 1969, where she was fully restored and is now a floating exhibit. 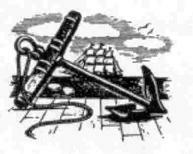 In a simple, easy-to understand account that also provides ample technical and historical detail, the author guides the reader through Emma’s adventures, misfortunes, and rescues, illustrating that the story of this fishing smack is really the story of the many people, especially those from the Noank area, who were responsible for her continued existence. Published by Noank Historical Society, Inc., Noank, CT, 2015. 116 p.: ill.; softcover; 6"x9". ISBN: 1515300803. Log of the DOWNIT, by Adrian Kingsbury Lane. Published by Noank Historical Society, Inc., Noank, CT, 1993. vi, 53 p.: ill., softcover; edited with pen and ink drawings by Richard Knowles Morris. Items are shipped UPS (USPS to P.O. Boxes). Please add a shipping/handling fee of $7.00 for up to two items delivered within the U.S.
To inquire about shipping rates for more than two items, for international delivery, or for any questions, please call 860-536-3021 or send an email to noankhist@sbcglobal.net.